There’s so much hiking to be done around here. 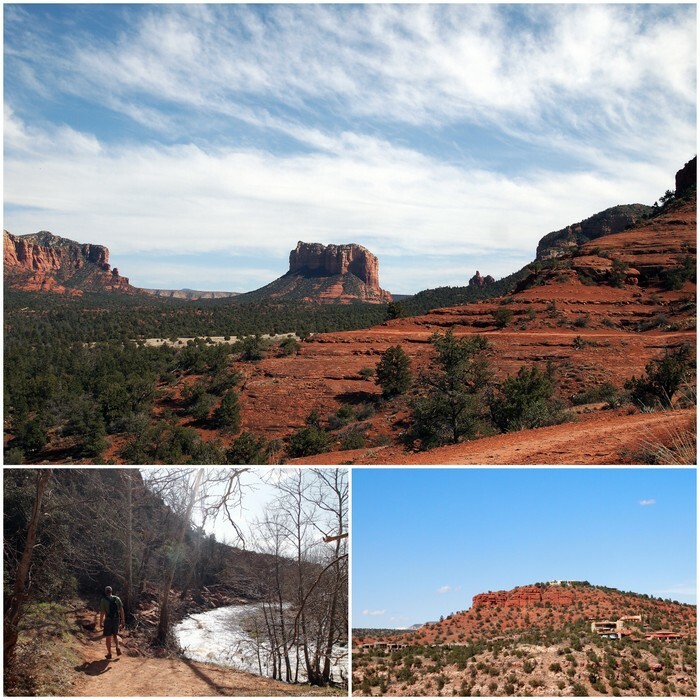 Big hikes, little hikes, hikes up high, hikes down low, hikes near water, hikes in canyons, hikes to Indian Ruins, hikes to find Geocaches…hikes, hikes, hikes. 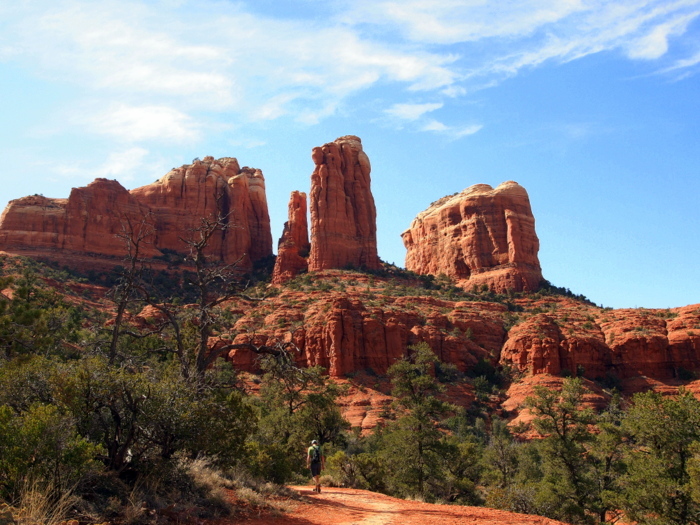 With all that hiking it comes as no surprise that majority of our time in Sedona has been spent..you guessed it- hiking! We had a few hot days last week. One day it reached 85 which is not the best temperature for hiking. I know people like to say the “dry heat” around here means that high temperatures don’t feel as hot, but I am not buying it. Sure, without the humidity you might not get as sweaty (and my hair is waaay less frizzy), but the sun is very strong out here and to me 85 feels like 85. On that particularly warm day we planned to go on a hike, but since I spent the morning in town doing laundry we didn’t get out on the trail until almost 1:00. The late start meant we needed a short hike, preferably with some shade. 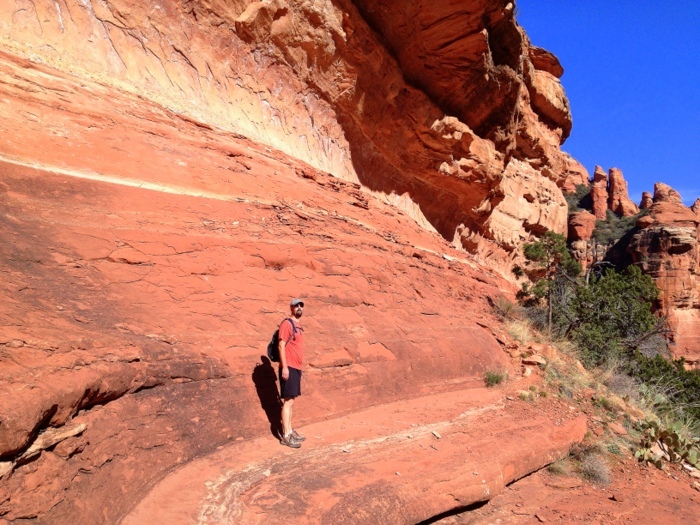 We chose Fay Canyon both for it’s short length and the possibility that hiking into a canyon would provide some relief from the blazing afternoon sun. The first part of the hike was a very easy stroll through the bottom of the canyon with large trees and views of the rocks towering above. 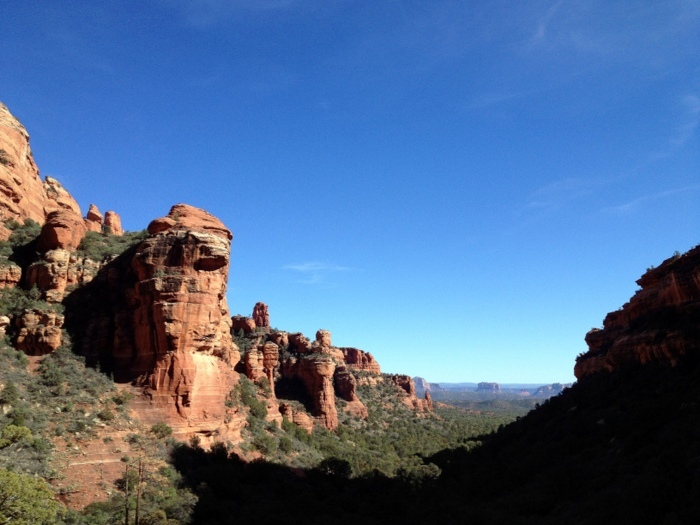 After about a mile we reached a steep rocky uphill that led to an amazing view looking out and beyond the canyon. This is where the trail ended. If we had turned around right there it would have been a very nice 2.5 mile hike with a fantastic view at the end. But is that what we did? No of course not. 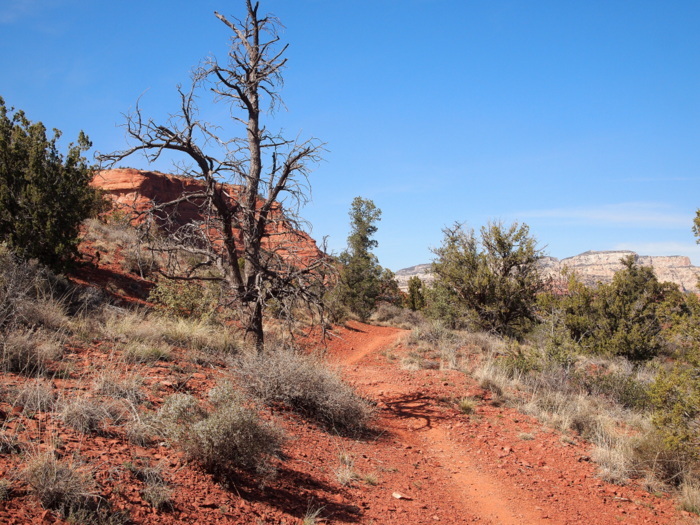 Instead we followed what looked to be a well used trail farther back into the canyon. The trail just kept going…and going…and going. 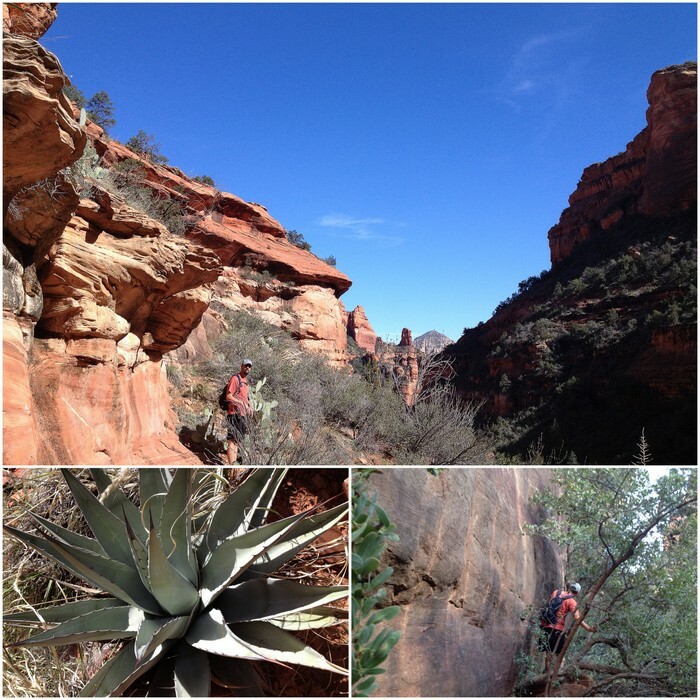 We hiked over wide open exposed rock, squeezed through thickets of prickly trees and skirted around sharp pointed agave plants that dotted the sides of the trail. After what felt like miles and miles of fighting the increasingly thick prickly shrubs we had enough. 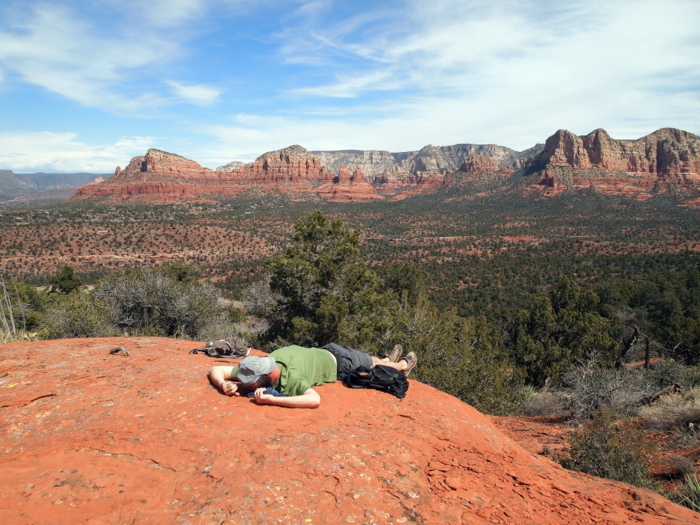 The trail descended down into the canyon and there we found a nice spot to rest and enjoy a snack. The trail continued on, but we did not. From where we stopped the trail then climbed up and up and up what looked like a very steep track filled with large boulders. Since we were both covered with scratches and Tim had bashed his knee pretty good on a rock it was time to turn around. In the end what was supposed to be an easy 2ish mile stroll through a canyon turned into an adventurous 5 mile journey over some pretty rugged terrain. By the end of the week the weather had cooled down and temperatures were holding steady at a perfect 75 degrees. It seemed like a great opportunity to try a longer hike. 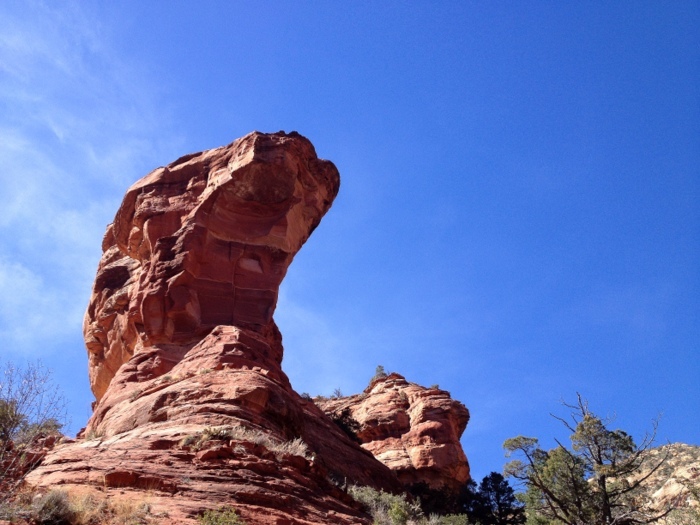 Like the Devil’s Bridge, this hike was recommended by a fellow traveler. 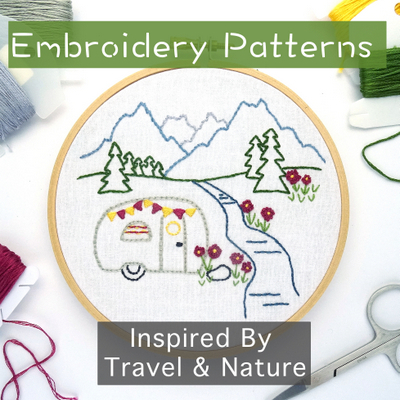 We love getting recommendations from other travels and blog readers. I can read all the reviews I want online but it never means as much as a personal recommendation. 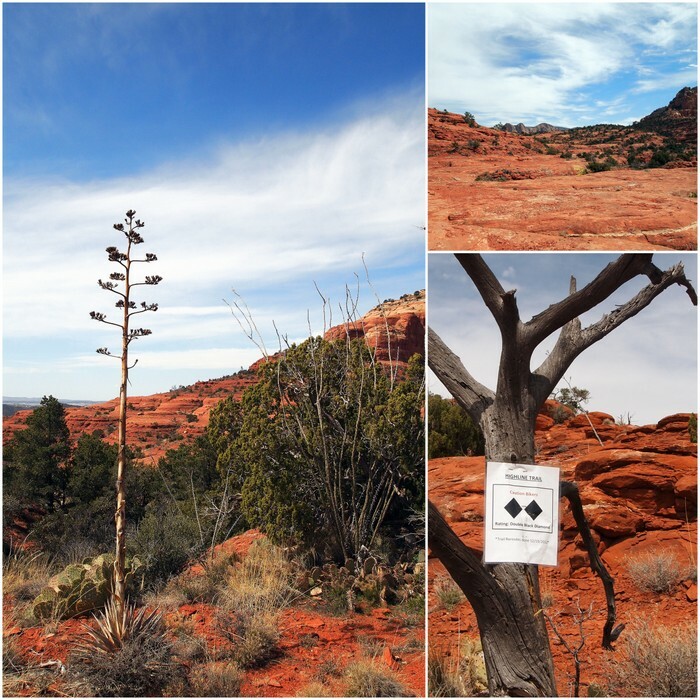 The Highline trail is actually a mountain bike trail so you won’t find it listed on any of the Sedona hiking sites, but I did find this one site that shows the track we followed. There are many places to start the trail. We choose to begin at the Baldwin Trail. In retrospect, we now think that a better place to start would have been at the Cathedral Rock trail-head because it was a shorter drive. From the Baldwin Trail we hooked up with the Highline Trail, then onto the Slim Shady Trail, then over to Templeton, and then back on the Baldwin loop. Essentially we ended up making a wide loop around Cathedral Rock. All together is was a 9 mile hike that goes down as one of our all time favorites for views and variety of terrain. As soon as we turned off Baldwin and onto Highline the trail began to climb up some steep terrain. Both ends of the Highline trail were marked with double black diamond signs warning bikers that this trail was steep and exposed. As we trekked up the slick, steep rock we could see why this trail was rated in such a way. Not a trail for a novice biker that’s for sure. After climbing for a few miles we came to an area where the landscape leveled out and this seemed like the perfect spot to stop for lunch and a rest. 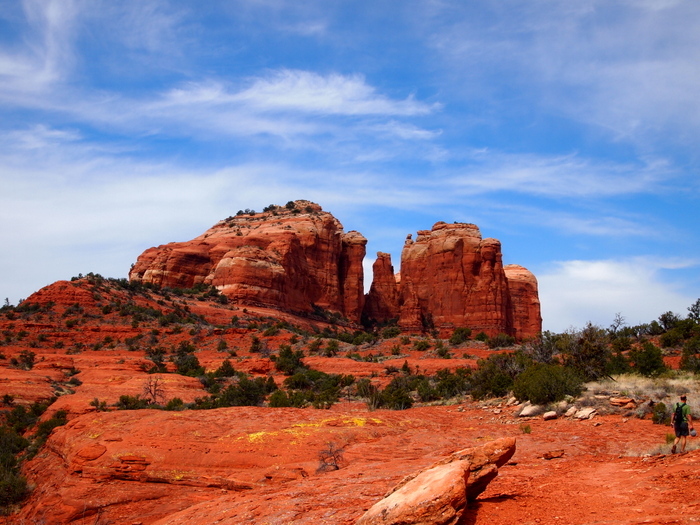 After lunch we continued to follow the trail as it wound its way around the edge of a tall rock formation giving us views of the town of Oak Creek below, and famous Bell Rock in the distance. From there the trail turned and went down into the valley where we jumped on the Slim Shady Trail and then onto the Templeton Trail. Now we were on the other side of Cathedral Rock and from the Templeton Trail had a great view of this impressive rock formation. The Templeton Trail skirted around the edge of Cathedral Rock passing some cool looking houses set into the hillside and then descended down to the banks of Oak Creek. After a quick rest stop by the river we left Templeton and jumped back on the Baldwin Trail to complete the loop. The hike ended up being a few miles longer than we thought it would be, but since only the first few miles were steep uphill it wasn’t too difficult. Overall the views were incredible throughout the entire trail and this is one we would definitely do again. This was another afternoon hike for us since Tim had some morning work stuff to take care of. We didn’t get out of the house until 2:00 so the requirements were that it be close by and short enough that we could complete in just a few hours. The Cockscomb Loop fit the bill. It is a 5.5 mile hike that circles around the base of Doe Mtn. Since it’s a relatively flat trail most reviewers said it could be completed in roughly 2 hours. We started at the Aeire Trail-head and circled to the east between Doe Mtn and Cockscomb Mtn. As we continued on the trail we could saw Chimney Rock in the distance, Doe Mountain on our left and finally Bear Mountain on our right. This was a great, easy hike that took us exactly 2 hours to complete. Perfect for a Monday afternoon. 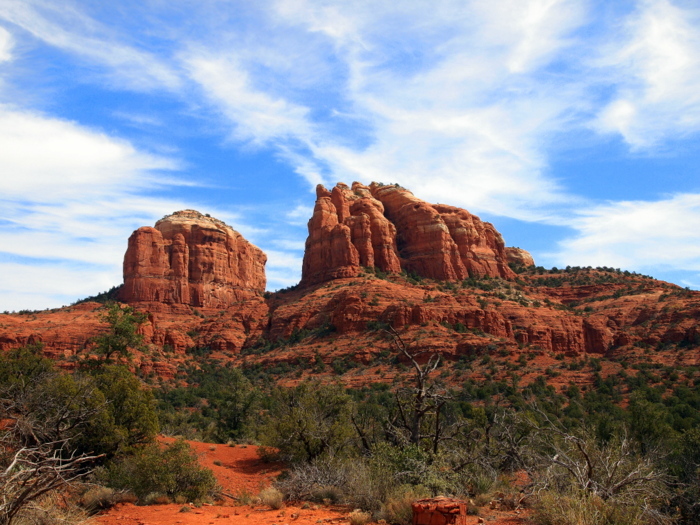 Right now the plan is to stay in Sedona until Thursday or Friday so hopefully we’ll get in a few more hikes before then. 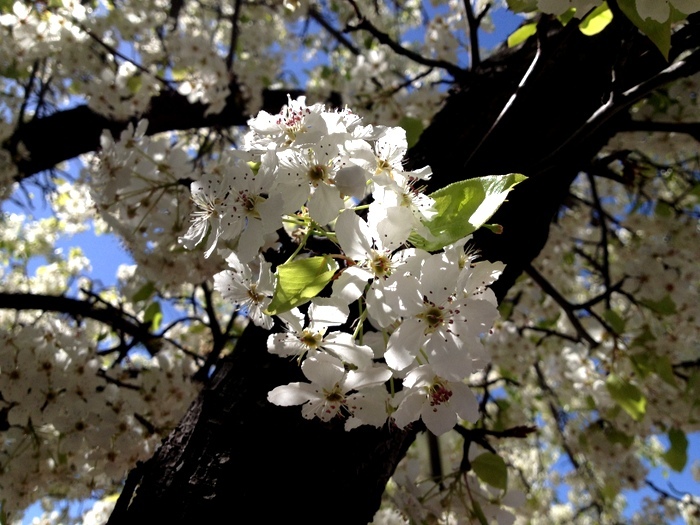 A flowering tree we spotted in town yesterday- Hello spring! Ahhh…what beautiful photos. 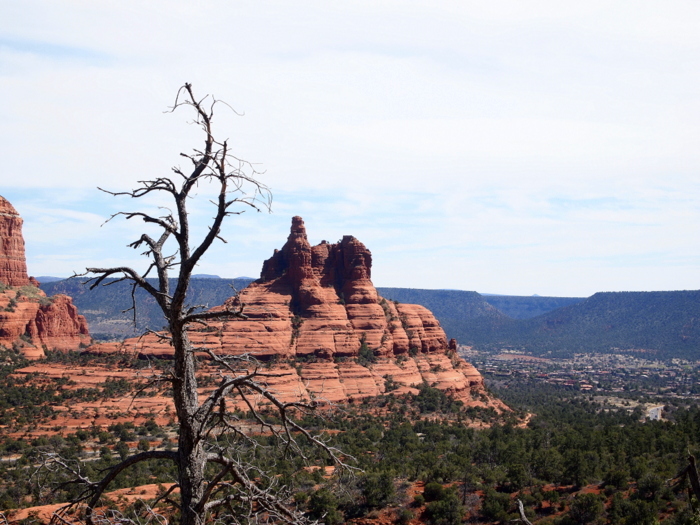 The scenery in Sedona is still my favorite. We just loved it there. After eight straight days of hiking, we tried to do Bear Mt. Only made it halfway. We were dead tried and it was way too late to make it up and back. If you get a chance check it out. You get higher than anything else and can see every where. Great rock scrambling but not too hard. so glad you are having a great time. Can’t wait to see more pictures!! We’ve been thinking about Bear Mt. We drive past the trailhead almost everyday and it’s always packed. 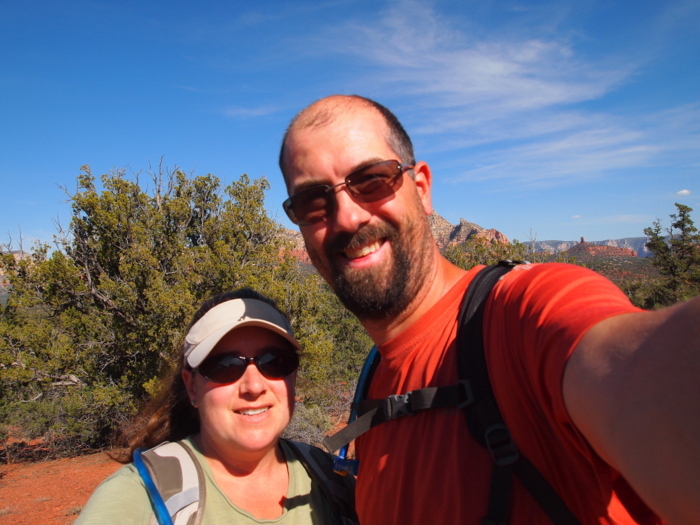 Maybe that will be our last day in Sedona hike. 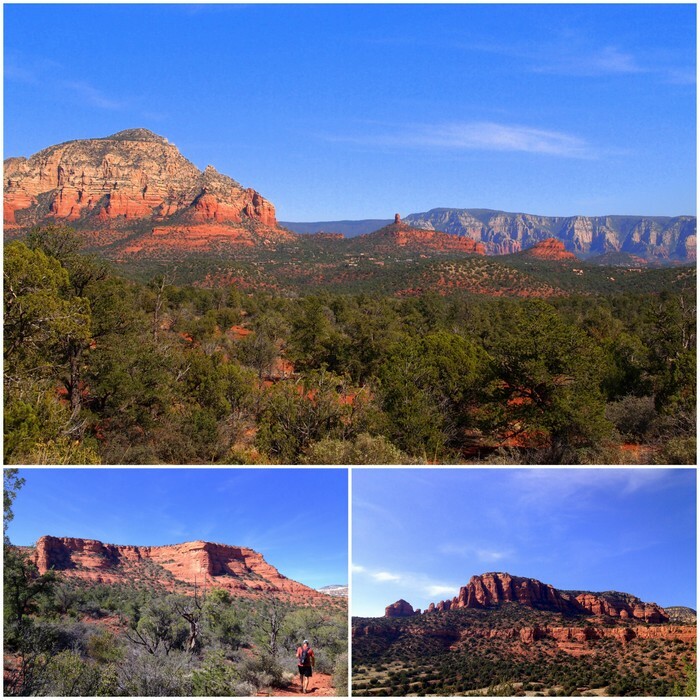 We’re definitely discovering that any hike is a good hike in Sedona! The Raisins help hold the peanut butter in- and taste yummy! Beautiful shots of the red rocks. 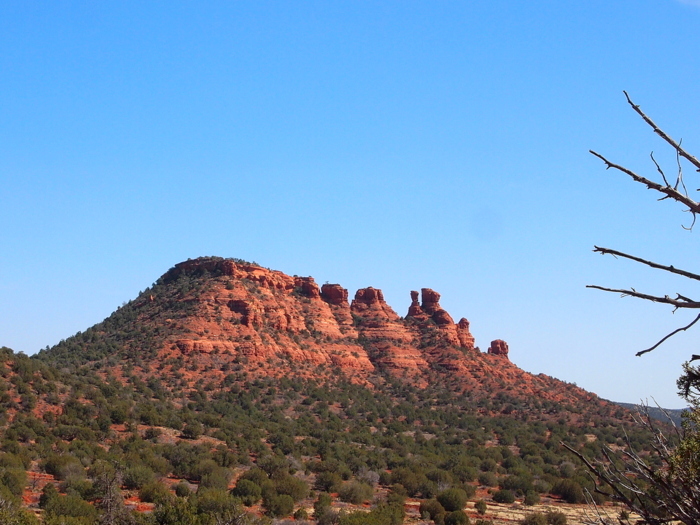 Those hikes will be on our list when we get back to the west. 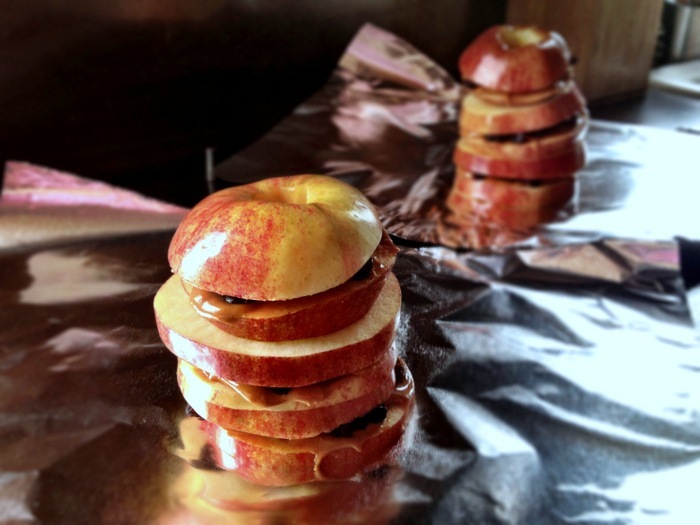 Those apples look very yummy with peanut butter and raisins, maybe I will try that. Fabulous looking hikes! Can’t wait to take the RV there. Thanks for the great snack idea!